Quoting Philips, ‘Smart lights are estimated to be the largest Internet of Things devices in the next 5-10 years.’ IoT has constantly been in the limelight, for all the good and obvious reasons. It won’t be wrong to quote IOT as the disruptive trend revolutionizing not only the industrial space, but the entire world, right from huge businesses to the minutest tasks performed on a daily basis. The future is steadily ‘bright’ with the latest development of IOT in the lighting space. Green revolution worldwide is serving as a strong bridge between the IOT and the lighting eco space. With the depleting conventional energy resources, the demand for energy conservation is leading the priority list of all the sectors. In response to this fact, smart lighting industry has established its footprint significantly in today’s era, penetrating every field right from the streets to the commercial infrastructure. Industry giants such as Philips, Samsung, GE, LG, etc., are generating a tremendous revenue share with their active participation in the smart lighting industry space. The coming years will witness a plethora of instances where the lighting market players and technology giants would collaborate to ensure maximum ROI and achieve huge profit margins from the evolving smart lighting market. GE Link smart light is one of those products validating the aforementioned point. The product is backed by an app on smart phone called Wink to control lighting from any location, enhancing the consumer experience. Other such promising products representing the integration of technology with the smart lighting market are Philips Hue, Samsung Smart Bulb, LG Smart Lamp Lumen Smartbulb, LIFX, Belkin WeMo. The smart lighting technology is taking over the traditional lighting sales, to a decent extent, if not completely. The same has been explained by LEDs gaining precedence over CFLs, on grounds of appreciable energy saving by the former. LEDs, being the best fit in the smart lighting market, require low power consumption between 6-8 watts, and boost an average life span of the light sources over 50,000 hours in comparison to CFLs (consuming 13-15 watts of power). Asia Pacific currently leads the market transition from traditional lighting to LED, with Japan and China being the prominent contributors. Rising use of LEDs and demand for wireless data connections will further garner profits for outdoor LED display market. It has been a decade since the connected devices have made their foray in the global technological space. The intersection of the connected IOT devices with smart lighting technology is addressing the top megatrends of urbanization. Smart lighting technology is gradually establishing its prominence across the residential, industrial, and commercial infrastructure. 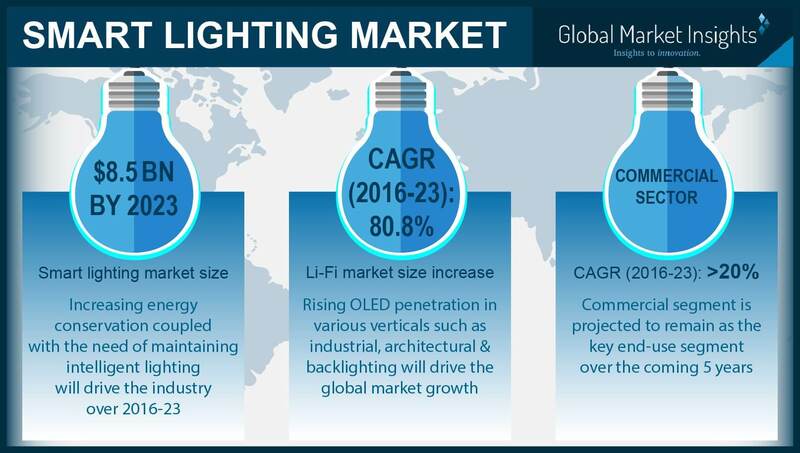 Taking into account these diversified applications, global smart lighting market is projected to register a CAGR of over 22% over 2016-2023, with a revenue estimation of USD 8.5 billion by 2023. Smart homes are one of the major end-users of smart lighting technology. Connected bulbs and switches are smart ways to light up home automation. These wireless bulbs which are connected to the internet or via cloud can be monitored and controlled with motion sensors, indoor sirens, and thermostats. In commercial or business spaces, lighting accounts for about 40% of the total energy costs, driving huge potential for smart lighting industry in this area. Smart lights can enable custom lighting arrangements in co-working spaces, enhancing the ambience and maximizing energy efficiency. As per reliable estimates, smart lighting market share from commercial applications are anticipated to record a CAGR of 20% over 2016-2023. Smart lighting in factories can help improve indoor air quality, competence, decrease operational cost, and enhance quality control. For instance, smart lights can be connected to HVAC systems to run at optimal efficiency by controlling temperature and humidity. Factories are leveraging on the deployment of smart lights to cut down reasonable expenditure. Cities waste a fortune over lighting. The use of smart lighting and LEDs could lead to a power saving of about 50% to 80% within a city. Smart cities can be effectively powered by connected street lights. There are over 4 billion outdoor lights across the globe. By installing smart lights, cities can improve energy saving through adaptive lighting control. Smart streetlights are also able to increase safety and security levels. Smart street lighting industry is tremendously expanding in Asia Pacific to meet growing regional demand. Reportedly, APAC smart lighting market will register a y-o-y of 20% from 2016-2023. On the technology front, Ericsson and Phillips are uniting to use streetlights to deliver better broadband connection for smart street lighting. Smart lighting industry is growing at a speedy grip which is backed by energy conservation laws of governments. The government and regulatory bodies across the globe have implemented a fundamental shift in energy policy. These stringent norms are triggering the penetration of more energy-efficient lighting sources, which in turn is favoring the smart lighting industry. For instance, China state government has passed a legislation on the ban of incandescent lightbulbs. The shifting focus toward green energy will provide a strong ground for the development of smart lighting industry. This market is forecast to become highly fragmented in the coming years owing to the ground being shared among the SMEs and the biggies together. This, on one hand will create a plethora of business opportunities for the multitude of industry players, while on the other hand, will generate fierce competition. This is bound to instigate leading providers of smart lighting technology to implement growth strategies to sustain the market and unleash truly brilliant innovations. Read more about our smart lighting market report at https://www.gminsights.com/industry-analysis/smart-lighting-market .